Stevie Ray Vaughan was born on October 3, 1954 in Dallas, Texas, the son of 26-year-old Martha Jean Vaughan and Jimmie Lee Vaughan , a soldier from Rockwall, Texas. For Christmas 1963, Stevie received a western toy guitar made by Sears and learned to play songs like "Wine, Wine, Wine" and "Thunderbird" by Texan garage rock band The Nightcaps. His brother, Jimmie Vaughan, was three years older and was his first big influence. Later influences would include such players as Jimi Hendrix and Buddy Guy. After a few years as a sideman in and around Austin, Vaughan formed the band “Double Trouble”, with whom he earned a platinum album with in "Couldn't Stand the Weather," released in 1984, and won a Grammy Award for best traditional blues recording for a song called "Flood Down in Texas." that same year. Donning his trademark wide-brimmed felt hat, he was also noted for using the Fender Stratocaster and, in the mid-1980s, gained popularity with his guitar jamming and blues sound reminiscent of music legends B.B. King, Muddy Waters and Albert Kins. But, in 1986, after years of substance abuse from alcohol and cocaine, “SRV” collapsed during an engagement in London. 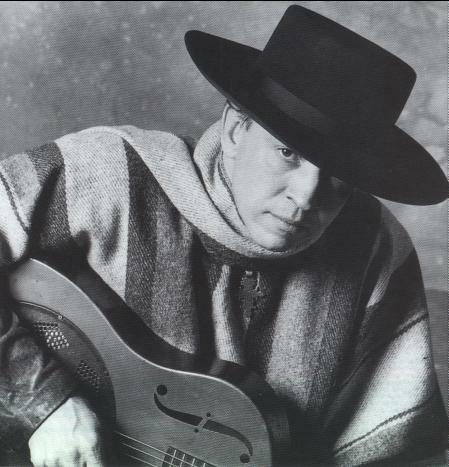 In 1990, the 35 year-old Vaughan, nicknamed “SRV” for his initials, he won a Grammy in the contemporary blues category for "In Step" – a reference to A.A.'s noted 12-Step Program. The success of the record propelled Vaughan on to a nationwide summer music tour, and was looking forward to the release of an album in September recorded with his older brother - himself now a well known musician who formed “The Fabulous Thunderbirds”. 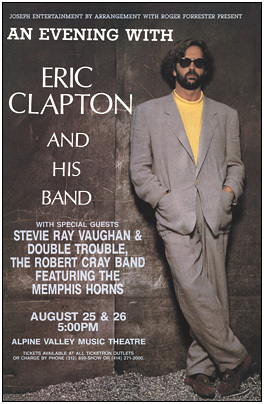 Called the "In Step" tour, Stevie Ray Vaughan was slated to play two shows - on August 25 & 26 of 1990 - at Alpine Valley Music Theatre – an outdoor theater complex located near a ski resort about six miles southwest of East Troy in southeastern Wisconsin - with Eric Clapton. The shows also featured Buddy Guy, Jeff Healey, Robert Cray, Jimmie Vaughan, and Bonnie Raitt. At the time, it was the largest amphitheater in the United States, and a popular venue for Milwaukee and Chicago concert-goers, as well as musicians and bands nationwide. Wisconsin State Journal music writer Michael St. John wrote on that evening's concert, “Texas terror Stevie Ray Vaughan followed, bobbing and weaving from Note One through an R&B instrumental that ignited every set of vocal cords in the packed amphitheater. Singing "The house is rockin' " was overstating the obvious. By the third song, Vaughan was playing like he wished there were a few more frets on his battered Stratocaster and his Double Trouble trio drummer KO'd the head on his snare drum. "Little Sister" was full of licks that could have given Vaughan's speaker cabinets third-degree burns. "Y'all ready?" was all the warning the crowd received before a frenzied romp through "Superstition," "Couldn't Stand The Weather," the musical machine gun bursts of "Crossfire" and the closer, "Voodoo Child," most of which was fired off one-handed,” before Stevie Ray Vaughan gave the stage to Eric Clapton. But, after Eric Clapton finished his set, at 11:55 pm – to ear-deafening applause – he introduced "the best guitar players in the entire world." One by one, Buddy Guy, Stevie Ray Vaughan, Robert Cray, and Jimmie Vaughan all strolled on stage with their Fender Stratocasters for an encore jam to Robert Johnson's "Sweet Home Chicago", a fitting tune as all of the musicians were home-ridden to "Windy City". After 20 minutes, they finished off the tune, the lights went up, and the musicians strolled off stage. Stevie Ray Vaughan was last off stage, giving one final good-bye before he disappeared into the darkness of backstage. Thinking ahead, tour manager Skip Rickert had reserved helicopters from Omni Flights to bypass congested highway traffic after the concert. The helicopters chosen were Bell 260B Jet Rangers, which were enough for five people to be seated, including the pilot. Seats were reserved on the third Bell 260B Jet Ranger for Stevie, Jimmie and his wife, Connie. However, a miscommunication between Stevie's and Eric Clapton's management happened, as three members of Clapton's staff - Clapton's Hollywood agent Bobby Brooks, body guard Nigel Browne and assistant tour manager Colin Smythe - took three seats on the helo. Leaving only one seat on the helicopter, and with SRV being anxious to get back to Chicago, he asked his brother, Jimmie, if he could take the last seat on the third helicopter. Since he didn't want to be separated from his wife, Jimmie told him that was fine – the couple would just catch the next helo flight to Chicago's Midway Airport. In the dense fog and pitch-black night – later described by a corporate pilot who attended the concert to NTSB officials as having a vertical visibility being good and horizontal visibility variable, though at most times more than a mile - the helicopters were clear for lift off at 12:40 that morning. Greg Rzab, a member of the Buddy Guy blues band who was on one of the four helicopters, said that the fog, and condensation sticking to the helo's exterior, were thick on takeoff. "We kept wiping the glass bubble on the copter ... and after we got up 10 feet, it fogged up again and we couldn't see," Rzab said. "I turned to Buddy and said, 'This is really bad,' and Buddy just looked at me and said, 'I hope they know where they're going.' " Just past the lift-off zone was a 300-foot hill. Vaughan's helicopter, registered as N16933, was piloted by Jeffrey W. Brown, who was unfamiliar with the flight pattern for exiting the area over a high altitude and in dense fog. Brown had a bit of a colorful aviation career to that point. 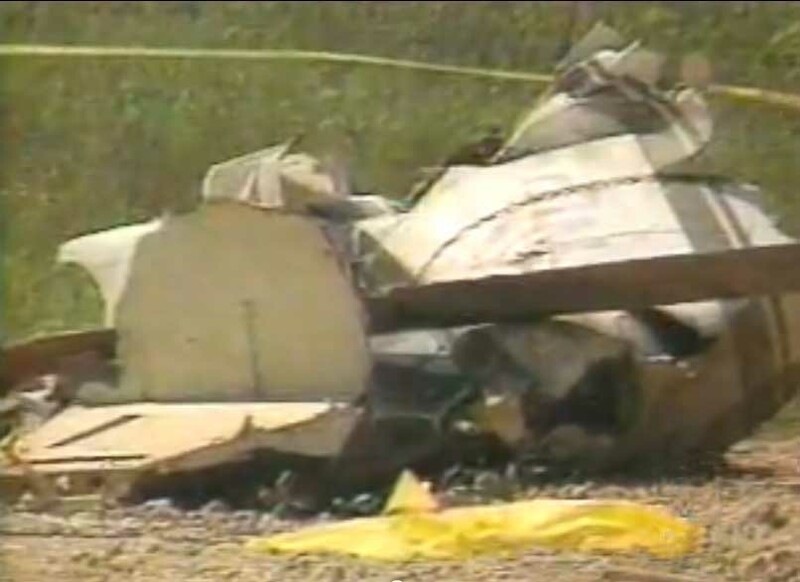 Records from the Federal Aviation Administration (FAA) showed that he had been involved in two previous minor crashes, including an "uncontrolled collision with the ground" in 1977 and a crash in September 1989 blamed on engine malfunction. The commercial pilot has also had his certificate suspended for four days in 1973 for improper marking of an aircraft, according to FAA spokesman Roland Helwig, at the agency's center in Oklahoma City, Oklahoma. And, on top of that, despite having a commercial helicopter rating, and being certified to instruct in helicopters, his instrument rating was only valid for flying in airplanes - not helicopters - a skill requisite to his intended flight. Brown was guided off the landing zone, flying at a high speed about a half-mile from take-off. It then, however, veered off to one side, disappeared into the darkness. At the airport in Kankakee, Illinois, the electronic signal sent by an emergency locator transmitter (ELT) was received shortly afterward, and local authorities were quickly notified, Walworth County Sheriff Dean R. McKenzie said. Authorities traced the signal to Walworth County by about 4:45 in the morning – around the same time that Omni Flights concluded that one of their Jet Rangers was missing – and then contacted sheriff's deputies about 5.45 a.m. that the signal originated near the resort. At 6:45 that morning, sheriff's deputies began searching the hill with help from the Civil Air Patrol. 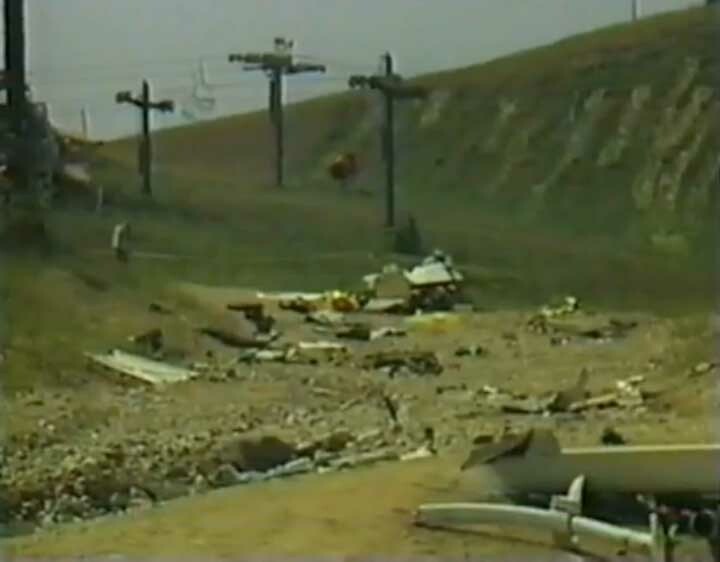 At 7:02 a.m., the bodies of all 5, and wreckage from the helicopter, were found near a ski hill at Alpine Valley, scattered along a gravel service road near the top of the hill. All were killed on impact, their bodies were thrown across a 200-foot slope. 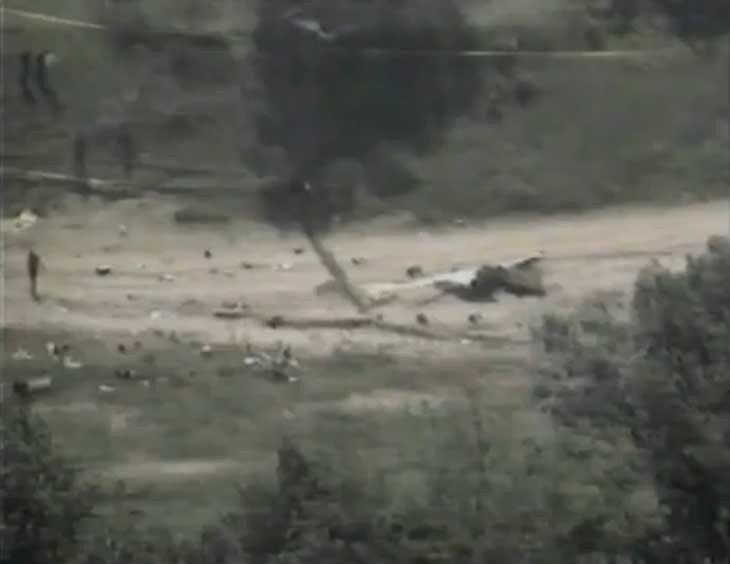 Initial observations were that the helicopter had slammed into the hill at such a high rate of speed and it happened so quickly that all 5 never knew what hit them. Walworth County Coroner John Griebel said autopsies showed the five crash victims all suffered multiple internal injuries and skull injuries that killed them on impact. Griebel also said signs of drugs or alcohol were absent from the wreckage, and that all five bodies were intact and taken to Lakeland Medical Center in nearby Elkhorn where, later that morning, Eric Clapton and Jimmie Vaughan would be summoned by Griebel to identify the bodies . About 40 fans from Sunday night's concert sobbed and gazed up the hill during breakfast that Monday morning at the resort's restaurant. 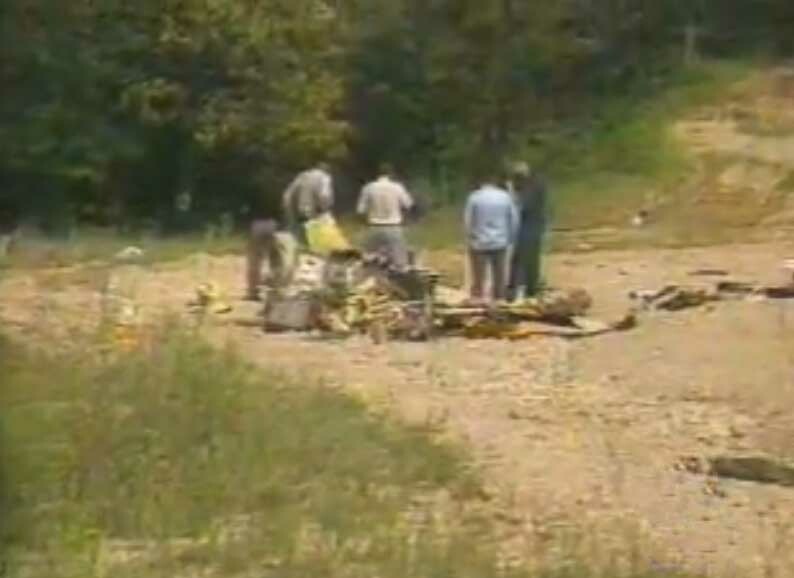 A handful made the quarter-mile uphill trek in steamy weather to view the wreckage, before the debris was moved the following day to an airport hangar at Janesville for further study. Bill Bruce, a National Transportation Safety Board investigator, said the Bell Jet Ranger helicopter slammed into the hill in dense fog, but it was not certain if weather contributed to the accident. "It was a high-energy impact at a shallow angle." Drucella Andersen, a spokeswoman for the National Transportation Safety Board, said NTSB investigator Bill Bruce was concentrating Wednesday on clearing remaining wreckage from the hill. Gene Doub of the NTSB regional office in Chicago said the wreckage would undergo a detailed check of mechanical systems. "They'll take a look at systems to try to rule in or rule out any mechanical malfunctions," Doub said. But the investigators were quickly finding that the fog and low clouds were a factor in the mishap. Dominic Scaffidi, a National Weather Service forecaster at Sullivan, said fog had reduced visibility overnight to below two miles in parts of southern Wisconsin, a condition requiring pilots to fly by instruments rather than sight. Back in Vaughan's hometown of Austin, and throughout the nation, his loss was sorely felt. "His death is particularly sad, given that he'd cleaned up and was playing the best music of his life," said Jeff Peterson of the "Austin City Limits" TV program on which Vaughan had appeared. "Stevie Ray Vaughan was like one of my children. " said B.B. King. "The loss is a great loss for blues music and all fans of music around the world. He was just beginning to be appreciated and develop his potential." "Stevie Ray Vaughan, Bobby Brooks, Nigel Browne and Colin Smythe were my companions, my associates and my friends," Eric Clapton said in a written statement for the crash. "This is a tragic loss of some very special people. I will miss all of them very much. I want to extend my deepest sympathies to their families. In Austin and San Antonio, hundreds of fans held candlelight vigils the evening of the crash in memory of Vaughan. Some wore T-shirts from his concerts and copies of his trademark wide-brimmed felt hat. "This is the big thing I respect about Stevie Ray. He'd come into the store, ever how big he got, and he was always Stevie Ray. His popularity didn't change him as far as this store is concerned one iota." said Ray Hennig, owner of Heart of Texas Music in Austin. "One of the prettiest things Stevie ever did — his first gold album that he got, when he got to town this is the first place he stopped. He came racing in here to show Steven, my son. and myself." Hennig said. Vaughan's family held a private family funeral service with public graveside committal at noon on August 31, 1990, at Laurel Land Funeral Home in Dallas, where Stevie was buried next to his father - who has died four years prior. The family asked that donations go to the Stevie Ray Vaughan charitable fund of the Communities Foundation of Texas in Dallas. The fund, set up after his death, was to be used for drug abuse programs. Now, there are many drug rehab program options available to any person who wants to get rid of his drug habit. Nevertheless, Eric Clapton performed a Tuesday night concert to the more than 16,000 fans at the Sandstone Amphitheatre in Bonner Springs near Kansas City less than 48 hours after the crash. But according to Gus Fasone, the general manager at Sandstone, Clapton refused all interviews and demanded that reporters and camera crews be barred from backstage, stating "The people around him, it's like they are in shock. Backstage, it's like they aren't functioning, they're going through the motions. But I think (the band) did an extremely brave thing.” Clapton's tour ended on September 2nd, at the Mississippi Coast Coliseum in Biloxi, Mississippi. 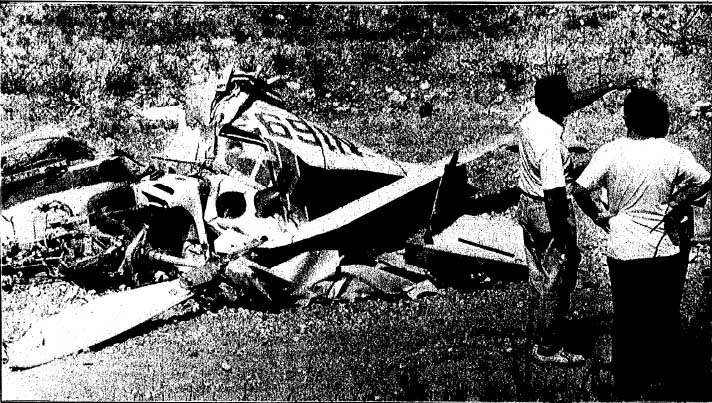 On September 11th, 1992, the National Transportation Safety Board determined the probable cause of this accident was the improper planning by the pilot, and his failure to attain adequate altitude before flying over rising terrain at night. Factors related to the accident were the darkness, fog, haze, rising terrain, and the lack of visual cues that were available to the pilot. Thomas Demetrio, a Chicago lawyer representing Vaughan's estate, said he was not surprised by he NTSB findings. Papers he filed in a July 1992 lawsuit for the estate contend that the helicopter charter company should have known that the weather "precluded safe flying conditions." John Neilson, Omni Flight's general manager, declined to comment on the NTSB report because he had not seen it and because of the pending lawsuit. 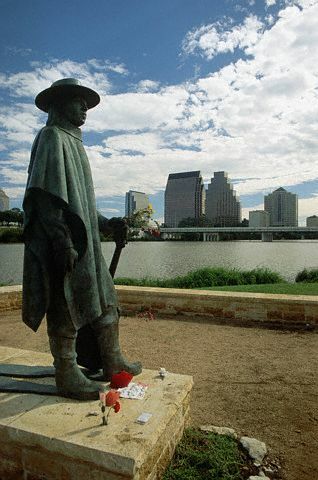 In November of 1993, a statue memorializing the blues guitarist was dedicated in Town Lake Park, Austin, Texas - near the site of his last Austin concert. On August 6, 1996, “A Tribute to Stevie Ray Vaughan” was released, on which Clapton covers several Vaughan compositions, in addition to B.B. King, Buddy Guy, Dr. John, Bonnie Raitt, Jimmie Vaughan, and Robert Cray.